I have been collecting Ambergris samples and Ambergris information for years and here is an update. We use it in the Natural Botanical Perfumery class. Ambergris gets it's name from the French ambre gris? (grey amber) to distinguish it from the fossilized resin, brown amber. 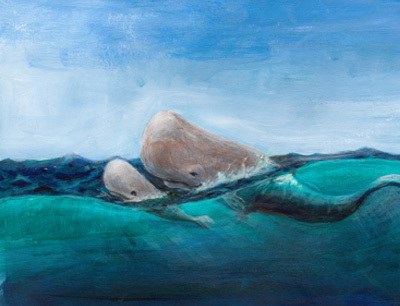 The raw material results from a pathological condition of the sperm whale Physeter macrocephalus L.syn P. catodon L.
In the normal course of events,calculus (sand and stones) or cachalot, is regularly ejected from the digestive tracts from adult sperm whales. There is some evidence, however, that certain materials, like the indigestible beaks of squid or cuttlefish (Elodone moschata) irritate the whales' digestive system, and in so doing, the offending substances develop a pasty pathological growth. It is possible that the cuttlefish itself contains ambrein, or that ambrein is formed by the digestive processes of the whaleâs gut acting on odorous substances within the cuttlefish. That upset stomach creates ambergris, a rare substance that has been highly valued for thousands of years as an ingredient in perfume and pharmaceuticals. to hundreds of pounds at a time. Ambergris cannot be compared to Castoreum or musk, but the physiological properties seem to be similar. 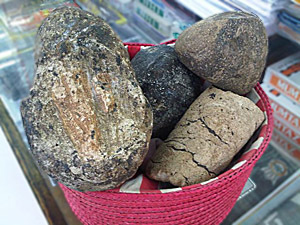 Ambergris was traded in N.W. Africa before the 9th Century. Louis XV is said to have used ambergris to flavor his favorite dishes, and Queen Elizabeth I used it to perfume her gloves (le Galliene 1928). Valued as a restorative, & dissolved in wine as an aphrodisiac (Comon 1955, Bovill 1973) and as a perfumery fixative, ambergris is the slowest of all perfume materials to evaporate. Viscous, black, stinky blocks of freshly expelled ambergris float on the ocean's surface. Sun, air and salt water oxidize the mass, and water continually evaporates. It hardens, breaks into smaller chunks and eventually becomes grey and waxy, embedded with small black squid beaks. The weathered chunks exude a sweet, earthy aroma likened to tobacco, pine or mulch. The quality and value of any given chunk depend on how much time it had spent floating or otherwise aging, says expert ambergris broker Bernard Perrin, because "it ages like fine wine." Ambergris was known to the Arabs as 'anbar and was originally called amber in the West It was used by the Arabs as medicine for the heart and brain. The Arabs believed that raw ambergris emanated from springs near the sea. In the Thousand and One Nights, Sinbad is shipwrecked on a desert island and discovers a spring of stinking crude ambergris which flows like wax into the sea where it is swallowed by giant fishes and excreted again as fragrant lumps to be cast up on the shore. The Greeks also believed that ambergris came from springs in or near the sea. They believed that it enhances the effects of alcohol when smelled before drinking wine or when it is added to wine. Many a bacchanal profited from a pinch of ambergris, no doubt. In 1783 the great botanist Joseph Banks presented a paper by Dr. Franz Xavier Schwediawer, a German physician living in London at the time, before the Royal Society, which ended, forever, Western confusion over ambergris and its origins. It correctly identified ambergris as a production of the often morbidly distended gut of sick sperm whales and associated its production with the beaks of the whale's principal foods, squid and cuttlefish. In 1820 two French chemists, Joseph-Bienaim?Carentou and Pierre-Joseph Pelletier first isolated, characterized and named ambrein, the principal active fragrant ingredient of ambergris. Since then a great deal has been published on the chemistry of compounds with an ambergris-like scent, especially the more fragrant oxidative derivatives of ambrein like ambrox. They are all labdanoid terpenes, which occur in a remarkable variety of plants, animals and microorganisms. At the right is an image of a pressed specimen of Monarda didyma L., bee balm, one source of labdanum extract, and a natural substitute for ambergris. These, and other, items are the base for fixatives and woody, sweet animal fragrances in the modern perfumery industry which, for the mostpart, uses synthetics in place of natural substances. Be one! Sign Up Now! essential oils, and CO2 and antique and library odors for analysis. what is available now as natural and what was available for comparison purpose. Vocabulary of Odor?as developed by Jeanne Rose is used. everything you need. 415-564-6785 Call to enroll. Internationally acclaimed author, Jeanne Rose, has graciously offered her recipes and writings to be used on the "all natural beauty" web site. Jeanne has been in the forefront of the movement towards using all natural products for many years. She is a master herbalist and aromatherapist that has made a huge impact in the field at large. 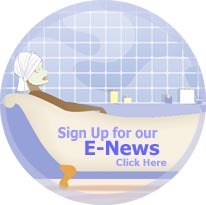 Please visit Jeanne's web site (jeannerose.net) to see her many books that she has written, as well as her all-natural products, educational opportunities and her special program, the "Aromatic Plant Project". You may call her at (415) 564-6785. Copyright 2003-2013 ?/font> SharAmbrosia. All rights reserved.